Editor Virgie Tovar is currently seeking submissions for a ground-breaking new fat positive anthology to be released in 2012. Please see the details below and HURRY! Deadline is Nov 15th, 2011. I’m seeking personal essays for a fat positive anthology to be released in 2012. I’m seeking essays that either (1) focus on a specific event/experience that was truly flabulous or (2) tell the story of how you became a fierce fatty. I encourage contributors to hone in on a particular theme—like romance, parenting, family, fatshion, dating, performance—to use as a lens through which to tell your story. Fierce, sassy, thoughtful, authentic, non-fiction, previously unpublished, autobiographical stories from fatties who identify as women are welcome. The vision for this anthology is one of fun, unapologetic fat celebration and love! Envision the book you would have wanted to read when you started out on your journey to fat positivity. This will be that book for a lot of people. So, share what you know and what you’ve learned, the way you navigate the world, your experiences, and don’t leave out the juicy parts! how did you become a fierce fatty? how do you create fat-positive spaces in your life? what was a pivotal moment or experience that led to fat positivity for you? how do you talk to family/friends about being a fatty? how do you “do” fatshion? how does being a fatty impact dating, sexuality and romantic relationship(s) for you? how do you turn society’s rules into your own personal politic? has performance (e.g.. fat belly dancing) impacted your body love experience? what people/communities make you feel fabulous? what role does your fierce fatness play into your friendships or family relationships? Don’t feel limited by this list of suggestions, please! Please send electronic submissions only. 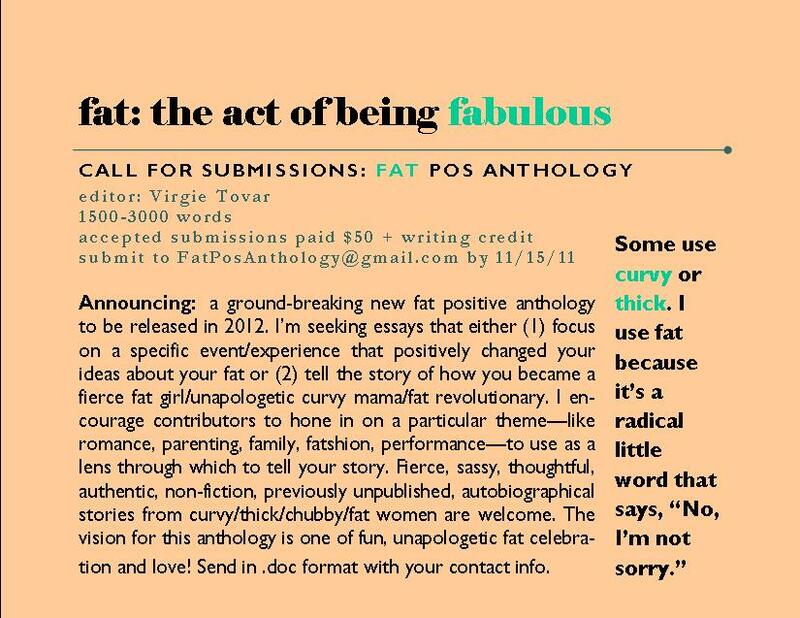 Attach your submission in MS Word (.doc) format to fatposanthology@gmail.com. Please include a short bio and your contact information in the body of the e-mail. Contributors of accepted submissions will be paid $50 and receive a writing credit in the book.